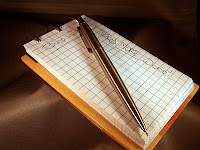 Shown in the photos with a Parker stainless steel mechanical pencil. The paper is 3x5" index card. I found some with a graph print so it can be written on in either direction. 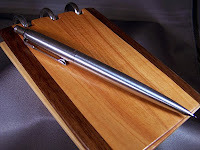 These will soon be for sale with a matching chrome and cherrywood pen for around $50 to help launch my sales business. The notebooks are bookmatched cherry. Some will have trim of various woods such as this blue mahoe (I'm out of BM though, so maybe not unless I can get my hands on some more). As usual, the discs are from Rollabind, in this case they're chrome plated. I'm not a fan of the plating, but I've gotta get rid of this bag of the things I have. The post from "Anonymous" was someone claiming to be from Rollabind and asking how to contact me. I had replied with my email address. That was on the 16th, and I have not received an email or any other communication. Either it was someone pretending to be from Rollabind for whatever reason, or they had a change of heart. Whichever it was, I have deleted those posts. This blog is about the craft of woodworking and the path of learning that is involved. Anything else is just a distraction.